NEW BRUNSWICK, NJ (July 13, 2016) – The 2016 Rutgers Equine Science Center Summer Showcase was a huge success! Close to 100 people participated in the kickoff celebration of the Center’s 15-year anniversary. Welcoming remarks were given by Dr. Karyn Malinowski, Director of the Equine Science Center, and Dr. Wendie Cohick, Chair of the Department of Animal Sciences, and Dr. Brad Hillman, Senior Associate Director of the New Jersey Agricultural Experiment Station and Director of Research. Presentation of the New Jersey Joint Legislative Resolution by Ann Dorsett to the Rutgers University Equine Science Center. (Left to right: Ann Dorsett, Liz Durkin, Sharon Ortepio, Karyn Malinowski, Carey Williams, Brad Hillman, and Wendie Cohick. 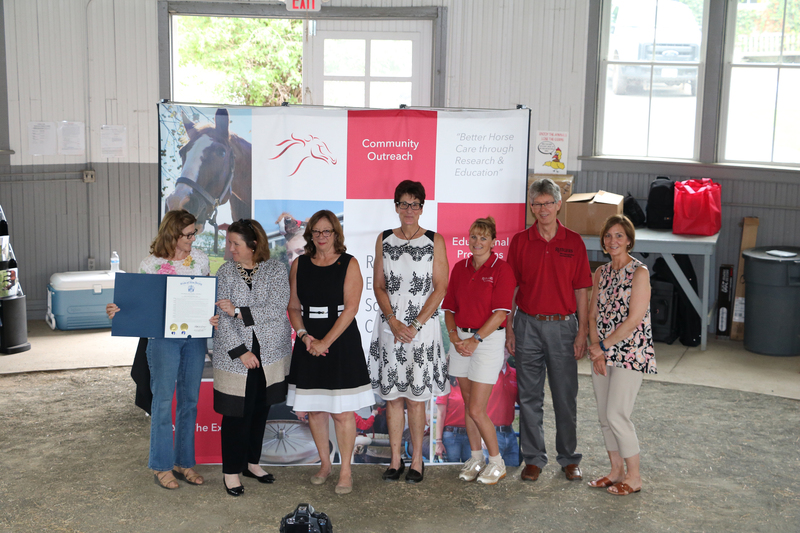 The event continued with the presentation of a Congressional Certificate from U.S. Rep. Donald Norcross (NJ-01), and presented by Ms. Sharon Ortepio, Chair of the Equine Advisory Board, a part of the New Jersey Department of Agriculture. A Joint Legislative Resolution, sponsored by N.J. Senator Bob Smith and N.J. Assemblymen Joseph Egan and Joseph Danielsen, and presented by Ann Dorsett, Vice-Chair of the NJEAB, was bestowed on the Center next. Finally the Center was honored with a ceremonial proclamation from the Monmouth County Board of Chosen Freeholders, sponsored by Lillian Burry. Guests were treated to a high-speed equine treadmill demonstration, where one of our mares, Randy, wowed the crowd with a big gallop. Our surprise visitors from I Excel Child Care in Perth Amboy, NJ were thrilled by the performance. 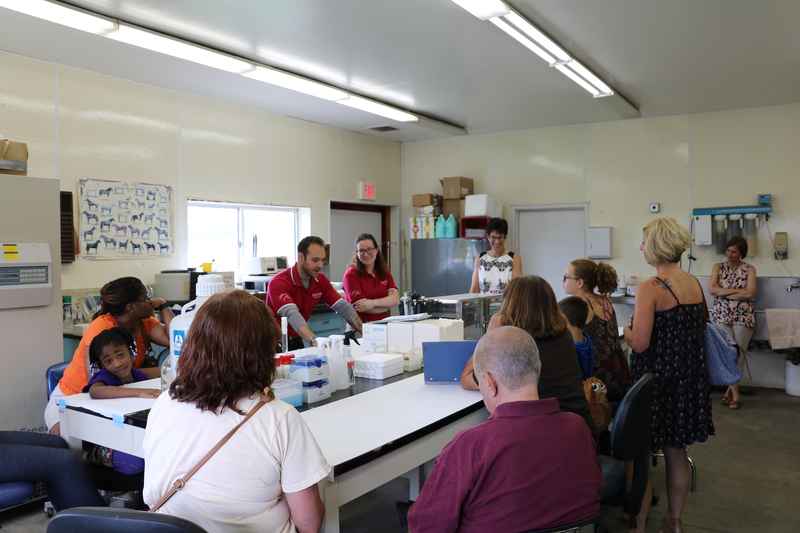 Visitors learn about the Center’s science from Dylan Klein and Kate Goodman at the Equine Exercise Physiology Laboratory. Attendees then broke off into groups and visited each of three stations that highlight some of the work done at the Center. The first was the laboratory. Center Director, Dr. Karyn Malinowski and graduate students Dylan Klein and Kate Goodman discussed the types of research currently underway. Next, groups learned all about the equine skeleton with “Wishbone,” the center’s life-size model, and Dr. Carey Williams. The final station was all about fun and games with guests participating in “Equine Science Jeopardy,” testing their horse knowledge, with Dr. Nettie Liburt.